One of the busiest parts of the Great Harbour Way / Te Aranui o Pōneke is the Wellington Waterfront. On one evening I went down to help distribute Love Cycling bike plates (a bit like number plates, but with a logo and website address, to help the campaign to make Wellington [more] cycle friendly city. I was impressed by the number of commuting cyclists, despite the cool and windy conditions, and as usual there seemed little evidence of conflict between cyclists and pedestrians (although of course there were a few who could profitable have revised the etiquette section of the Cruising the Waterfront video). 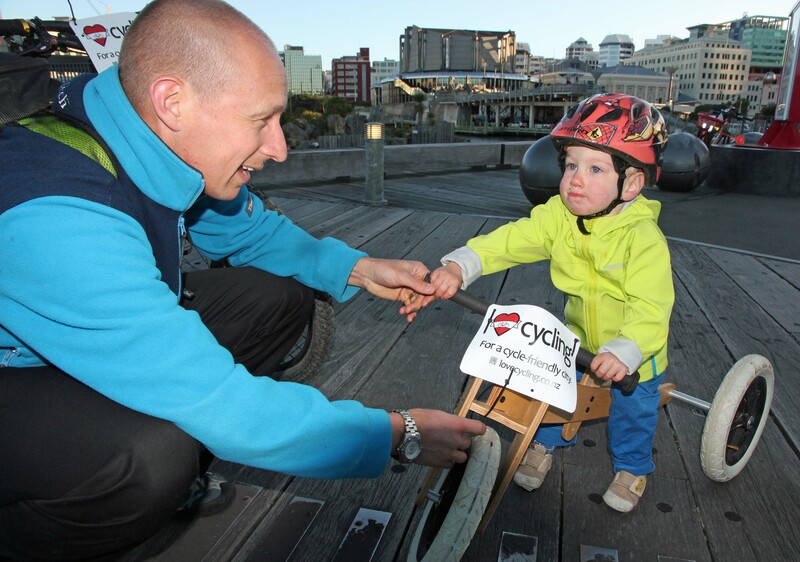 Also a range of ages, including the young lad pictured who’ll hopefully have much better cycle facilities when he gets to ride independently of Dad! Could the GHW protect this train? 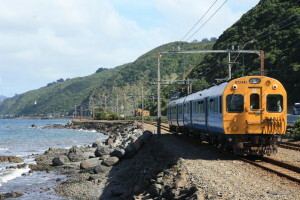 NZTA are reported to be considering building a new seawall to protect the rail corridor between Petone and Ngauranga. This is good news for Great Harbour Way/ Te Aranui o Pōneke, since it provides the opportunity to mount a shared walking and cycling path on the seaward side of the rail corridor. The existing cycle path runs between the rail corridor and the expressway, and in places there is simply not enough space to provide an adequate cycle route. At the same time, NZTA is not just looking at the Petone – Ngauranga cycle route in isolation, but is considering the cycling issues all the way from Melling to Aotea Quay. Although this wider scope may prolong the investigation, it is likely to result in a better route for cyclists.